Retailers in the US led the decline in equities yesterday, with the Dow Jones losing 29 points to 16,649. A test of the record high is now a distinct possibility but it seems that investors felt the need for a breather first, taking some profits off table. As a result, European stocks look set to open fairly flat this morning, but the 'risk on' button shows little sign of being switched off. When a lurch to the upside loses momentum, it is fairly normal to see a retracement of sorts as profits are booked and bears catch a whiff of honey. In this instance though, the sell-off is showing little sign of materialising. However, once the sun goes down, they will be looking to find the stairway to heaven. Data is thin on the ground in Europe today but we may get some excitement in the afternoon session. Initial Jobless claims and a chance that the US economy contracted 0.5% in the first quarter await traders who have been fairly starved of fun recently. European equities look set to open fairly flat as investors take stock after another impressive day of gains. Following the bank holiday, markets took heed from a positive global outlook and a 'concern-free' day of trading. The bears are lacking the headline grabbing alarm bells to trigger a sell-off, so until that time, stock markets may well drift higher as volatility, and therefore risk, decreases. The DAX will be looking to join the Dow Jones and the Nikkei in the exclusive 'five figure' club today. The top 30 German stocks are only 50 points away from a major level and currently sits at double the number from 32 months ago; what a turn around. On a separate issue, UK mortgage approvals fell for the third month on the trot on Tuesday as the housing market looks as though it's just at the point of running out of steam. A surprise rise for durable goods orders sparked a rally in US markets, pushing the Dow Jones 28 points higher to 16,682. In a separate report, US consumer confidence increased to 83 from 81.7 last month. Additionally, the S&P Case Schiller index of property prices indicated double digit growth. This kind of sustained strong economic data may help the Dow to test the recent record high of 16,699. Whilst it is normally a nonsensical point of reference for struggling market commentators, if you look at last year's FTSE price at this time last year, and compare it to a month later, you will notice a drop of more than 800 points. Investors will also take confidence from the Volatility Index (VIX) which is at a 14 month low. From a simpler standpoint, markets have not provided the excitement they are capable of recently, surely something is bound to catch investors unawares soon? 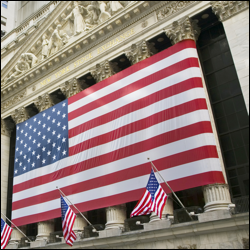 By and large the Memorial Day holiday kept investors on the sidelines amid a shortened session for the US indices. However, encouraged by the recent strong economic data, those who did participate remained in buying mode, pushing the Dow Jones another 29 points higher at 16,654.